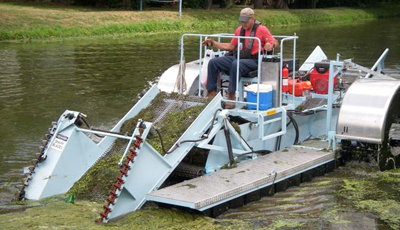 The smallest aquatic weed harvester in our fleet is the ILH 5x4-100 "Mini" series. Holding up to 1,500 lbs. 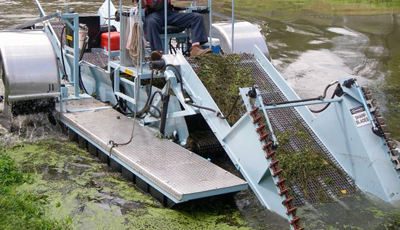 or 100 cu ft of aquatic vegetation, the ILH Mini is the perfect choice for smaller ponds, lakes, and waterways that are shallow or require tight maneuverability. The ILH 5x4-100 "Mini" is equipped with an air-cooled engine as well as high temp and low oil shut down for safety. 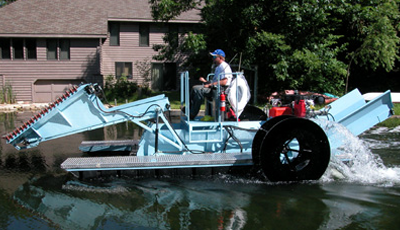 The machine is propelled by side-mounted paddle wheels coupled to direct-drive hydraulic motors. The motors are low speed, high torque, and wear-compensating to increase motor life. The "Mini" comes with three hull options: polymer, steel, or stainless steel and the remainder of the machine is finished with a heavy marine-grade topcoat. Transporting the Mini is a snap with a simple loading trailer. *Note: The "Mini" comes standard with SD duty galvanized belting; stainless belting is optional. Trailer, trailer conveyor, and shore conveyor. Environmentally friendly hydraulic fluid/oil is available as an option to help keep your lake and waterways safe. 3,500 lbs. 8,200 lbs. 12,200 lbs. 14,000 lbs. 17,900 lbs.